Imagine a world in which a sequel to Demolition Man not only exists, but stars Meryl Streep as Sylvester Stallone's long-lost daughter. It's incredibly difficult to fathom such a thing, unless it were done as a sketch at the MTV Movie Awards. However, this was actually an idea that was being floated at one point. How close did it actually get to happening? Not all that close, but it's still an absolutely amazing and bizarre thing to try and picture. The crazy idea for Demolition Man 2 was recently revealed by Daniel Walters, who co-wrote the original 1993 sci-fi/action hit. As it happens, producer Joel Silver was interested in making a sequel and his idea was to bring in Meryl Streep, who even by then had earned her place amongst the great performers of our time, to be a major fixture of the movie. Here's what Walters had to say about it on a recent episode of the Projection Booth podcast. "I get a call from Joel. 'What do you think of this? 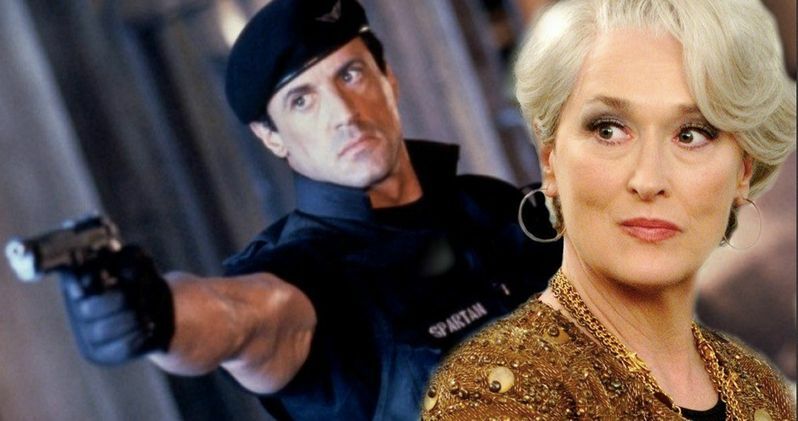 Meryl Streep is Stallone's daughter for the sequel. What do you think?' I'm like 'Okay, you get Meryl on the set and I'll come out.'" In case you aren't familiar, or just need a refresher, the plot of Demolition Man kicks off when a bunch of innocent victims are caught in the crossfire in Los Angeles' intensifying war on crime. Cop John Spartan (Sylvester Stallone) and violent thug Simon Phoenix (Wesley Snipes), the men responsible, are sentenced to a state of frozen incarceration known as "CryoPrison." When Spartan is finally thawed 36 years later, it's 2032, Los Angeles is now a pacifist utopia called San Angeles. But with Phoenix again on the loose, Spartan must team up with future cop Lenina (Sandra Bullock) to apprehend the killer. They end up blowing a lot of stuff up while trying to kill one another in a poorly-predicted futuristic landscape where Taco Bell is the only remaining restaurant. Originally, the movie featured a subplot, in which, Spartan reconnects with his daughter after years apart. She's now older than he is since he's been frozen for so long. Joel Silver intended to use this scrapped storyline to jumpstart the story of Demolition Man 2. And Meryl Streep was how he was going to sell the idea. It's unclear if he ever even reached out to Streep about the project. If he did, she assuredly said no pretty quickly. Demolition Man was a success at the box office and was largely embraced by critics at the time. So the idea of doing a sequel isn't all that crazy. It's just that the one they came up with was rather crazy. Recently, Taco Bell released a commercial for the return of their Nacho Fries that serves as an unofficial prequel to Demolition Man. The restaurant also set up a futuristic Taco Bell, like the one that was seen in the movie, at San Diego Comic-Con. That's as close as we'll probably get to a sequel. Pour one out for what could have been, movie lovers. You can check out the latest episode of the Projection Booth podcast for more with Daniel Walters.